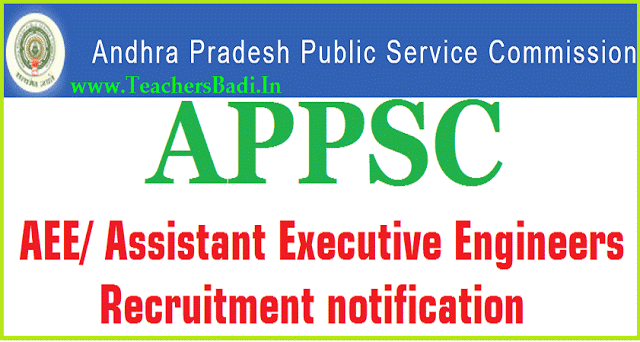 Assistant Executive Engineers-Notification No.06/2016 List of Provisionally selected candidates/ APPSC AEE Main Exam Result 2016, Certificates Verification From 26 April,2017: Andhra Pradesh Public Service Commission (APPSC) has declared the main examination result for recruitment to the post of Assistant Executive Engineers in various Engineering Services. Candidates who had appeared for the main examination held on 29-30 December 2016 can now check their result at the official website of the Commission at psc.ap.gov.in. Certificate verification for the provisionally admitted candidates will be held 26 April 2017 onwards. Concerned candidates must note that original certificates are required to be produced in the Commission's office from the above mentioned date at 10.30 am onwards. Certificate verification will continue till 16 May 2017 for APPSC Assistant Executive Engineer post. APPSC AEE main examination was held in 13 district of Andhra Pradesh and Hyderabad in Telangana for recruitment to the post of Assistant Executive Engineers. Web Note-Final Selection List for AEE post : It is hereby informed that the list of candidates provisionally selected for recruitment to the post of ASSISTANT EXECUTIVE ENGINEERS IN VARIOUS ENGINEERING SERVICES Vide Notification No.06/2016 has been declared. The list is available in Commission’s website i.e., www.psc.ap.gov.in as well as in the Notice Board of the Commission’s Office. It is hereby notified that on the basis of the results of Screening Test (Written Examination) held on 06/11/2016 and Main Examination (Computer Based Test) 29/06/2016 & 30/12/2016 and verification of Original certificates held from 26/04/2017 to 16/05/2017, 28th, 29th May 2017 and 3rd June 2017 the candidates, whose Register Numbers are given below have been provisionally selected for appointment to the posts of Assistant Executive Engineers in Civil/Mechanical/Agricultural branches (Direct Recruitment-General) in various Engineering Departments vide Commission’s Notification No.06/2016, Dt.17-8-2016 subject to the following conditions. 3) That the Candidate should produce original certificates as may be required by the appointing authority in accordance with the Rules / Notification. Original certificates will be verified from 26 April till 16 May 2017 at Commission's Office, Prathibha Bhavan, Opp. Gagan Vihar, M.J. Road, Nampally, Hyderabad - 500 001. The Commission says, "If any category the available posts are filled even before the list is exhausted, further verification will not be done." It is hereby informed that the list of candidates provisionally admitted for verification of original certificates for the post Assistant Executive Engineers vide Commission’s Notification No.06/2016 is placed on Commission’s website www.psc.ap.gov.in. The verification of original certificates will be held from 26-04-2017 at 10.30 AM on wards in the Commission’s Office. The detailed date wise schedule of verification of certificates may be seen in the Commission’s website. Sub: Recruitment (Direct) to the post of Assistant Executive Engineers in various Engineering Services (General Recruitment) Notified vide Commission’s Notification.No.06/2016 dt:17/08/2016 and Corrigendum to the Notification No.06/2016, dt.07-10-2016 - Intimation of Date of Verification of Original Certificates - Reg. 2) Result Notification Dt: 13/01/2017. bearing H.T.No…………..........................a Candidate for the post of Assistant Executive Engineers in various Engineering Services (General Recruitment) notified vide Commission’s Notification.No.06/2016 is hereby informed that on the basis of Written Examination held on 29th & 30th December 2016, he/she is being called for provisional verification of original certificates. The Schedule for Verification of Original Certificates is hosted on the Commission’s website www.psc.ap.gov.in. He / She is, therefore, directed to attend for verification of Original Certificates on ………………. at in the Office of the Andhra Pradesh Public Service Commission , Prathibha Bhavan, M.J.Road, Nampally,Hyderabad-500 001, alongwith the following Original Certificates and one set of Photostat copies duly Attested by the Gazetted Officer. I. Date of Birth (SSC or its equivalent) in support of Minimum / Maximum age as on 01/07/2016. II. Service Certificate/ Any other certificate in respect of age relaxation claimed. III. Integrated Community Certificate (issued by the concerned Tahsildar/M.R.O./R.D.O) by BC, SC, ST Candidates. IV. Creamy Layer exemption certificate from Revenue authorities for BC candidates only, as per G.O.Ms.No.3, BC Welfare (C2) Dept., dt. 04/04/2006 and G.O.Ms.No.26, BC Welfare (C) Dept., dt.09/12/2013 who claim reservation under BC Community. V. Study Certificates from IV class to X class if studied in school or Residence certificate for 7 years prior to appearing in SSC, if appeared for SSC as a private candidate. VI. Local status certificate in case of candidates who have migrated from Telangana State to Andhra Pradesh State in between 2nd June,2014 and 1st June, 2017 as laid out in Circular Memo No.4136/SPF & MC/2015-5, Dated.08/08/2016 & 03/09/2016. VII Bachelor’s Degree in Engineering Prescribed for the post as per Notification.No.06/2016 as on 17-08-2016. VIII Physically Handicapped (VH, HH &OH) Certificate in the Prescribed proformae clearly showing % of deformity issued by the District Medical Board/Civil Assistant Surgeon, who claim PH reservation. XI In case there is any spelling mistake/ mistakes in the Certificates produced by the applicant including the degree certificate, a certificate from the competent authority stating that the original certificates pertaining to him/her are to be produced on the day of verification. X Hall ticket for the Written Examination in original and copy of this memo for verification of Original Certificates. XI Two attestation forms duly filled by the candidate and attested by the Gazetted Officer. The Candidate also directed to affix his/her latest passport size photograph duly attested by a Gazetted Officer on the top of each attestation form. XII Two Check lists duly filled and signed by the candidate. XIII. 3 Latest Passport Size photos. Since it was mentioned in the Notification and Hall tickets. c) If he/she does not submit Degree certificate, his/her candidature will be rejected. iii) He/she should visit the Commission’s Website: www.psc.ap.gov.in & download Memo, Two checklists, Two attestation forms, breakup of vacancies, Notification.no.06/2016. Non-creamy layer certificate, as per G.O.MS.No.3 backward classes welfare(C-2) department, dt:04/04/2006 and G.O.Ms.No.26, BC Welfare (C) Dept., dt.09/12/2013. iv) The disabled (VH, HH, OH) candidates shall undergo medical examination before State Medical Board or Civil Assistant Surgeons, as the case may be, as directed by the Commission (probably on the next working day of certificates verification). The candidate who has to undergo for medical examination is required to pay RS. 600/- towards Medical Exam fee, to the hospital concerned at Visakhapatnam. The candidate must note that this is only verification and should not be construed as final selection. Subject to fulfilment of the conditions and other eligibility aspects with reference to the Commission’s Notification No.06/2016, dt: 17/08/2016 and Corrigendum to the Notification No.06/2016, dt.07-10-2016 On verification, if the conditions laid down in the notification are not fulfilled by the candidate, his/her candidature for selection to the post will be rejected . NOTE: The candidates should not bring cell phones into the premises of APPSC.